Warning: this blog post contains clichéd images of stereotypical Italian holidays. Sorry, I couldn’t help it. If I had to describe Sardinia in one word, I’d choose stunning. 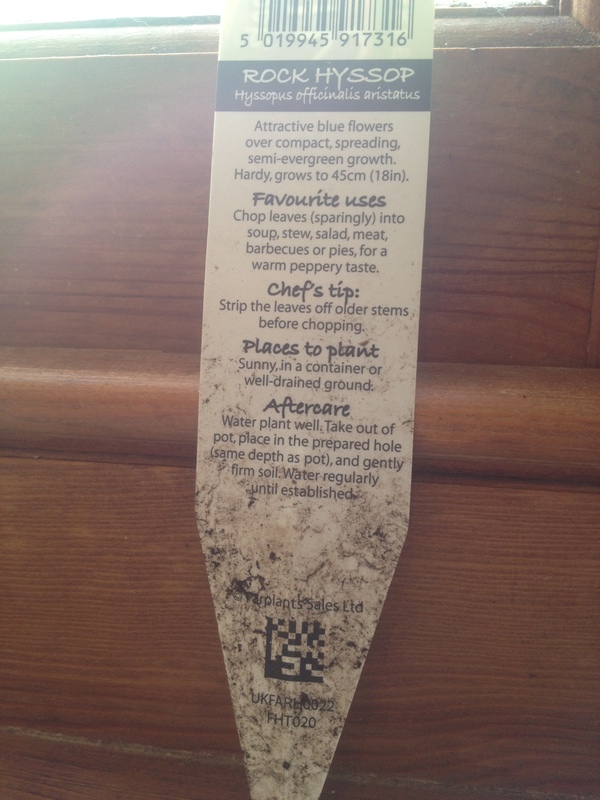 But since I can be as verbose as I wish (I’ve been quiet for ages!) I’ll also go with warm, incredibly varied, exotic, funny, intriguing and unforgettable. Having mostly lived in enormous cities, I’m always surprised to find myself in fully working cities that are also manageable on foot. Alghero has 40 thousand people living by the sea (I am told this number goes up to 4 times as much in summer), and the Mediterranean is right there. You can smell it and see it from anywhere in town. It was really my civic duty to get to know their sea food properly. Luckily, our flat was just down the road from the daily fish market, which made the task less arduous. Inside the market, I ate at what is probably the restaurant with the fewest overheads in history: fresh fish from 5 minutes away, fried or barbecued. And a choice of local cold white wine. Vegetarian menu shortcomings aside, that meal was one of the highlights of the week, and the market on Via Cagliari a stop I’d recommend to anyone visiting Alghero. As for the city itself, it was full of surprises. This was my first time in Sardinia, and I wasn’t sure what to expect from Alghero. The image I had from Sardinia was exclusive beaches, remote Berlusconi villas, and intimidating millionaire tourists on dubious yacht parties. What I found on our first stop was a beautiful, lively city that has a life outside the tourism industry, although it clearly makes the best of the summer months too. 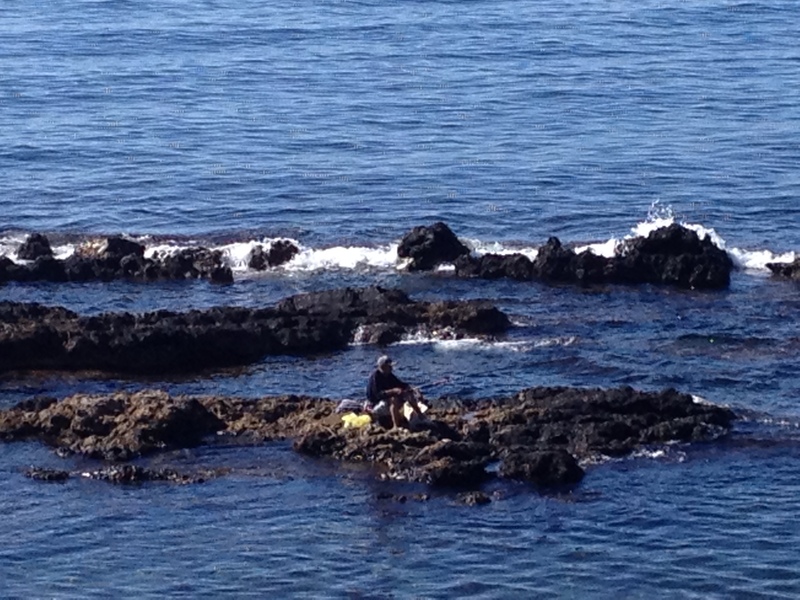 I didn’t see any obvious millionaires, but I met a lot of fishermen. The walled historic centre is reasonably well preserved, while the town that has developed around it is well planned and green, and the local beaches clean, accessible and gorgeous. Alghero was populated by Catalan settlers from the 14th century, and in its eventful history has had both Catalan and Spanish as the official language, before it went back to Italian rule in the early 1800s – well, it was then really the House of Savoy before the Italian unification, but that country has way too complicated a history for this blog. My point is, the Catalans have left a strong mark, and the local dialect heard in the streets, along with the unique architecture and local food makes the place feel very Spanish. There is a local version of paella (same name) made with the Sardinian fregola pasta; crème catalan is a ubiquitous dessert, and food names such as seadas sound decidedly un-Italian. And speaking of seadas: thinly rolled-out dough made into a large pasty, filled with fresh sweet cheese and deep fried. What can I say? Seadas are usually served with drizzled honey (I found they have an adoration of honey all over Sardinia, with menus specifying which varieties you can have: from strawberry tree honey, to rosemary, eucalyptus and chestnut), or sugar. It is an amazing dessert. Available everywhere I went, always freshly made. I had mine with sugar. Back at the market, being left alone in that fish Disneyland for 5 minutes, I of course could not resist buying some squid and sardines, and since I was there, some Sardinian buffalo mozzarela smuggled amongst all the seafare. The mozzarella was firmer and saltier than the better known one from Campania, but still very good. We had a lovely flat with a roof terrace overlooking other terraces and gardens that looked much more tropical than Mediterranean: I had breakfast over banana trees, pomegranate and sharon fruit. Determined to use as many Sardinian ingredients as I could manage, I used the sardines with pan carasau and herbs to make a stuffing for the squid. 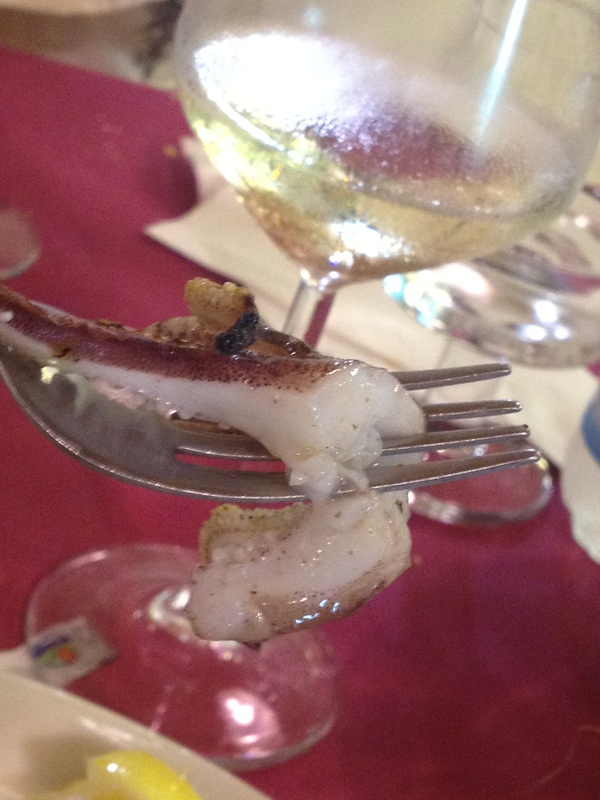 I then barely grilled the squid just to get a bit of a smokey flavour in them, and cooked them in Vermentino white wine. To go with the squid: green fried tomatoes, the breadcrumbs crust also made with pan carasau. I am fully aware of how touristy this is, but is there anything better than a quick food shopping spree in an Italian market for a delicious, fresh and easy dinner? 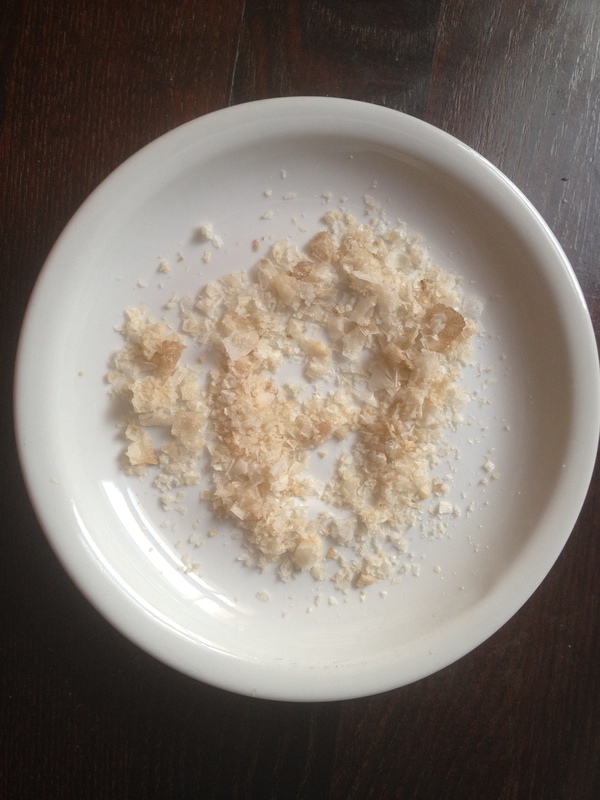 A note on the bread: pan carasau is a Sardinian bread religion, and I was given a few lectures during the holiday on just why this is obviously the best and most versatile bread in the world. Of Italians I admire the passion for food, and the modesty. I must admit that I never ‘got’ pan carasau before. It is very thin, crispy, and I didn’t quite understand what to do with bread you can’t mop food with. A fortnight in Sardinia has converted me, and the stuff really is delicious. Alghero had enough going on for a full weeks’ stay. The beaches were far above my expectations, and you would be happy if all you’re looking for is a beach break right in the middle of autumn. All it takes is a 10 minute bike ride (through pine trees!) to reach a stunning sandy beach – Pineta – almost deserted, despite the temperatures of over 25C and warm waters in late October. Walking through the beach in town, the scenery is very rugged and really wild, like nothing I’ve seen elsewhere in continental Italy. There are lots of other beautiful beach destinations, all under 10 miles away – Capocaccia being a highly recommended one, although we didn’t make it that far. But Sardinia really is as varied as you’ll be told by any tourist brochure. We then headed to the mountains and found a whole other world, of which I’ll talk in another post. For now, I’ll keep looking at my photos and wishing I could pop round the fish market for a quick oyster feast. Casa Del Formaggio: Via Mazzini, 43. 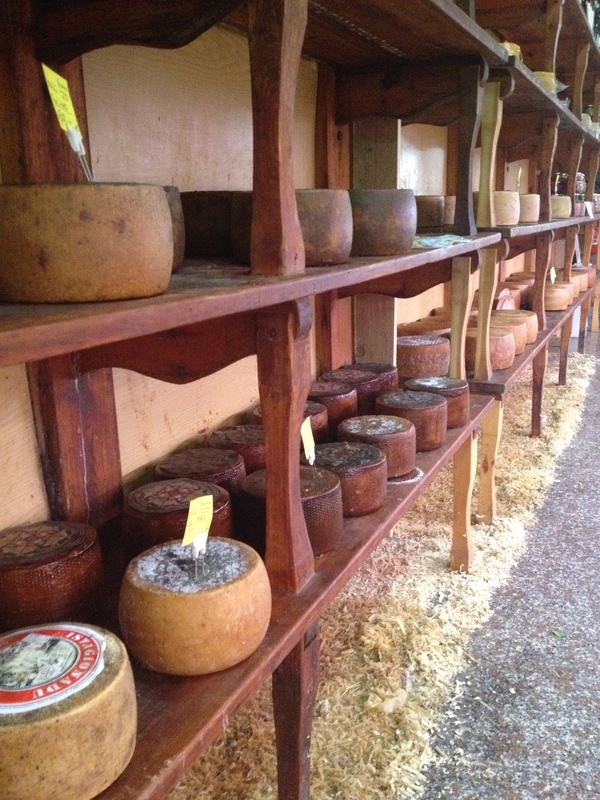 We were treated to a sampling of pecorino by age: from 6 to 12 months, accompanied by full explanation of origin and production of each cheese by the passionate and deeply knowledgeable owner/shopkeeper. 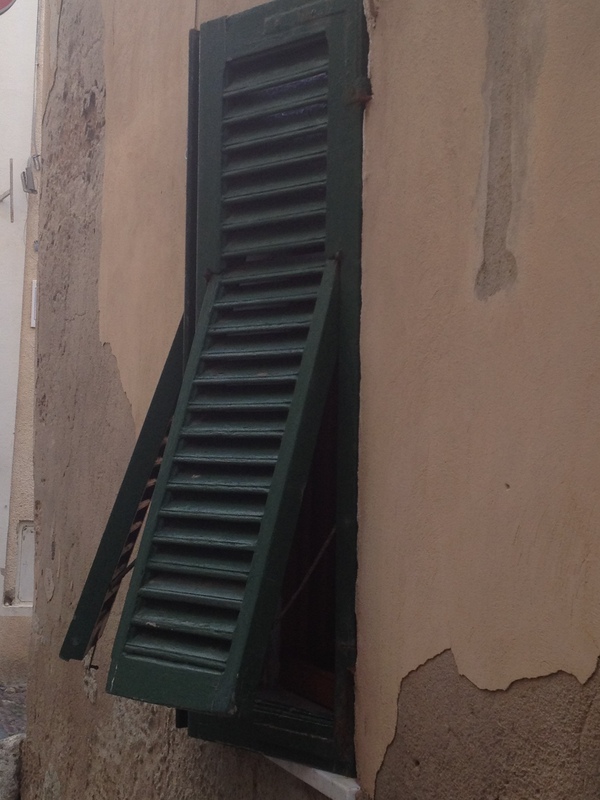 Our flat: through the wonder that is airbnb, we found this gem in central Alghero. The landlady, Giovanna, picked us up from the airport, gave us a city tour on the way home, and even baked us cookies! She lives in the flat downstairs with her family and my new Algherese best friend, Pongo the dog. And best of all, the flat has this dream of a pasta making table! Which I will from now on include in every birthday and Christmas wish list until I get one. A perfect base from which to explore the town, and a reminder of how shortsighted and petty New York’s attack on airbnb is. Long live airbnb and the benefits it brings to tourists, landlords and any city. Sword fish. This is my all-time favourite fish, and I tend to go crazy on it during trips to Italy, since it’s a popular fish there. At La Botteghina (Via Principe Umberto, 63), they had a sword fish carpaccio that was out of this world. Have it. Al Refettorio: Vicolo Adami, 47. Again, beautifully fresh swordfish cooked with capers. And a dessert I ate so quickly and so avidly the waiter asked if I’d like a second one. It was: a pistachio fondant with a warm almond and pistachio filling. Get out of here! A special note of thanks to Luigi from Capo Caccia Foods in London, who generously shared his insider tips on his hometown of Alghero before we went – and who, bizarrely, we bumped into while there! 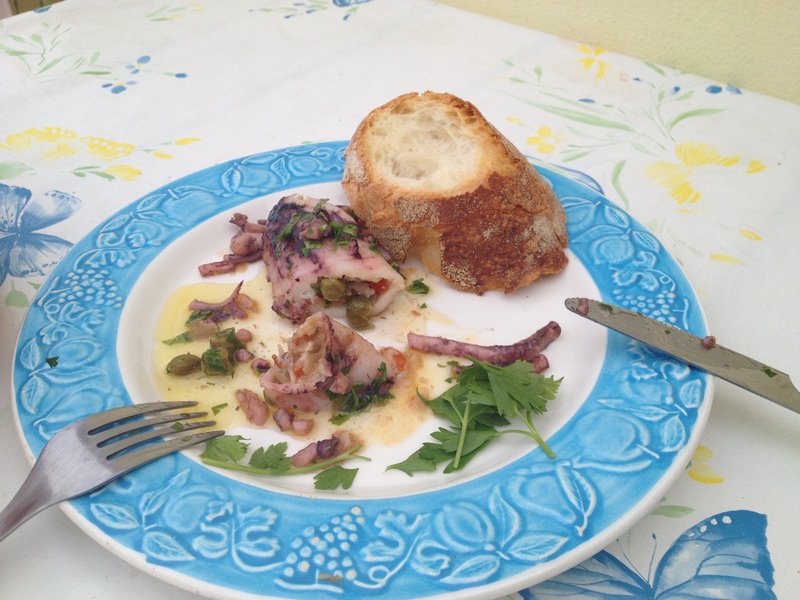 If you’d like to try Sardinian food before you venture there, a visit to Capo Caccia will make you book your tickets in a minute. 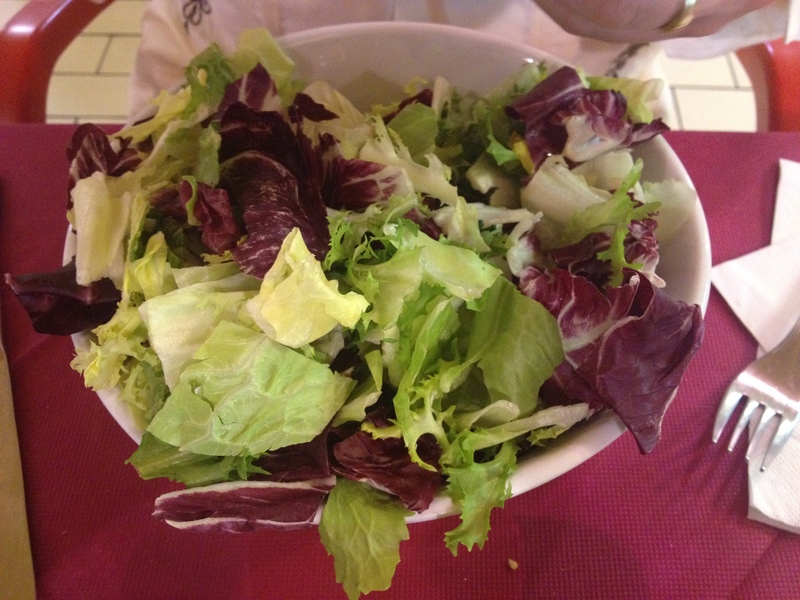 I wanted to use local Sardinian ingredients for my dinner, although many of the ingredients here can be replaced. The pan carasau can be replaced by any bread. Just adjust the quantities, as the bread is there only to give some consistency to the filling. Don’t make it to doughy. 4 whole squid, cleaned, cartilage removed. cut off the squid tentacles and chop them. break the pan carasau into rough pieces into a small bowl and cover it with water and the tomato sauce. Mix it all and let the bread to soak while you prepare the sardines. fry the spring onions in 3 tbsp of oil. Add the peppers and fennel and cook for 2 to 3 minutes until tender. Add the sardines, the tentacles, some salt and pepper and cook for about 3 minutes on medium heat until the sardines are done. squeeze the bread to drain off the liquid and transfer it to a separate bowl. Add the prepared sardines, the lemon zest, capers, salt and pepper, and mix it well to form a paste. stuff the squid with the sardine filling. Secure each squid with a toothpick. heat up a griddle pan and cook the squid on the highest heat for just about half a minute on each side, only enough to get a bit of colour and a smokey flavour. on a deep saute’/frying pan, fry the chopped onions in about 3 tbsp of olive oil until translucent. Add the squid, cook it for a couple of minutes, and cover it with the wine. Cover and cook on a medium heat for about 10 minutes, until the liquid has almost entirely evaporated. London is one giant barbecue at the moment. As part of the nationwide effort to squeeze every last drop out of summer, checkered picnic tablecloths cover every available patch of grass, and the permanent aroma of grilled meat permeates the air like a thick Victorian fog finding its way through the pores and crevices of the city. On my commute back from work one evening last week, I looked like a cartoon character dreamily following the hypnotic t-bone shaped smell of deliciousness. It wasn’t going to be a salad dinner. Midweek barbecues can be a hassle, though. Especially if your dining companion is vegetarian. What could be a matter of firing up the grill and throwing a couple of sausages on it becomes a ritual a bit like this: venture into the cellar and dust off the portable barbecue for the non-meat items; fetch some halloumi from the Turkish shop; think up a combination of peppers, onions and various other vegetables with simultaneous cooking time that can be stuffed into the same skewer; agonise at the supermarket over whether it is acceptable to buy a chicken thigh shaped tofu schnitzel. It’s not that I don’t like the halloumi, and the peppers, the onions, and the … sorry, no, the ready-made veggie burgers I really cannot abide. My point is that I believe there is a place and a time for vegetarian meals. Barbecues for me mean barely cooked red meat, fat dripping on the fire, hissing and releasing that irresistible smell that makes your stomach jump with excitement. Eating rich pork sausages while you wait for the really good stuff to get ready. Fresh fish just seasoned with salt, pepper and lemon, gently smoked. Ripping the meat off pork ribs with your bare teeth. Skewers of chicken hearts. Not grilled halloumi. 1. The Resident Vegetarian had a work dinner that night. 2. I had no-one left to blame, and really was simply too lazy and too hot to start a barbecue just for myself. Looking at the red slices of chorizo at the deli counter, I thought they would be quite lovely fried with white fish. It would placate my craving for a smoky dinner. And the chorizo reminded me of one last important thing that day: sitting in my food bloggers’ weekend goodie bag was a tin of smoked paprika. I had been wondering how to use it. I grabbed the only decent fresh fish I could find at that time and went home to make cod, paprika, and whatever else I could find. Which was: some spinach, a bit of smoked bacon, and 3 (three) new potatoes. Hardly the stuff of dream banquets, but sometimes the lack of choice makes you use ingredients more wisely. To complete the smoky theme, I also found something else I had been meaning to try for a while, again buried in the goodie bag bounty: smoked salt. 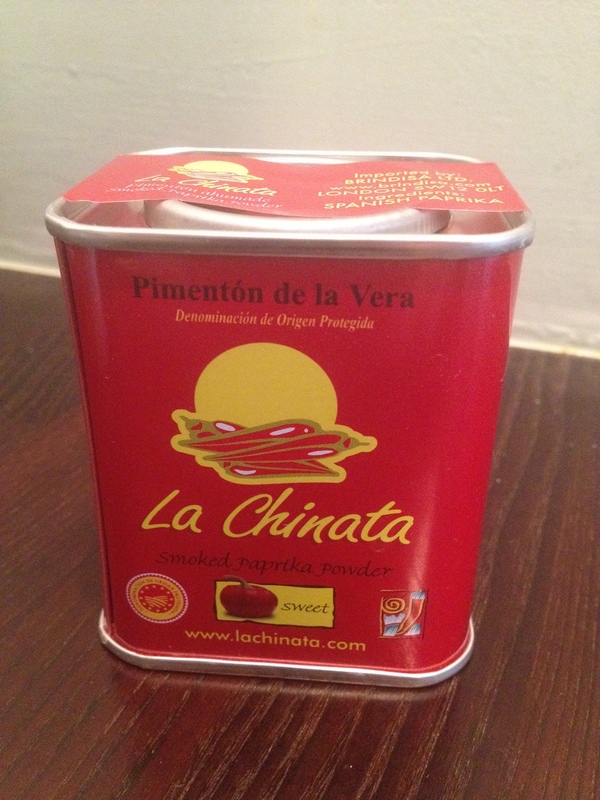 I have one question left after last week: how come I haven’t been cooking with smoked paprika all my life? It is wonderful! I am forever hooked. I used the same big frying pan 3 times, for the bacon, the spinach and the cod, making a point of not washing it in between to make the best of all the tastes. As for the potatoes, well, I wasn’t sure if I was meant to fondant new potatoes, but I thought I’d give it a go for the sake of experimentation. If nothing else, it would take no time at all to cook 3 small new potatoes. It did work rather well, actually, but they weren’t as pretty as perfectly cut proper fondant potatoes like King Edward or Maris Piper. 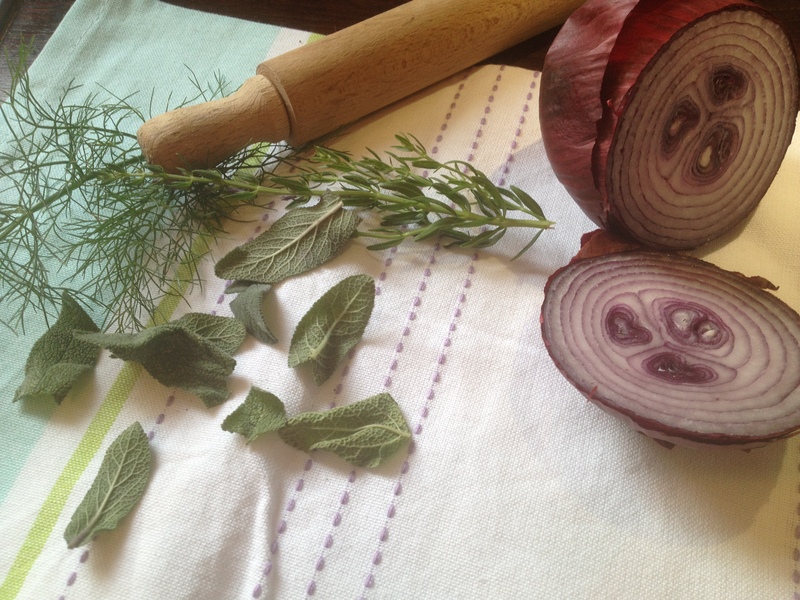 For flavour, I used sage, a tiny bit of fennel, and – God only knows how I had that – a herb called rock hyssop, which turned out to have a lovely spicy lemony taste. I started on a cold bottle of Portuguese vinho verde, and by the 20 minutes it took to cook dinner, somehow the 1st glass had evaporated. 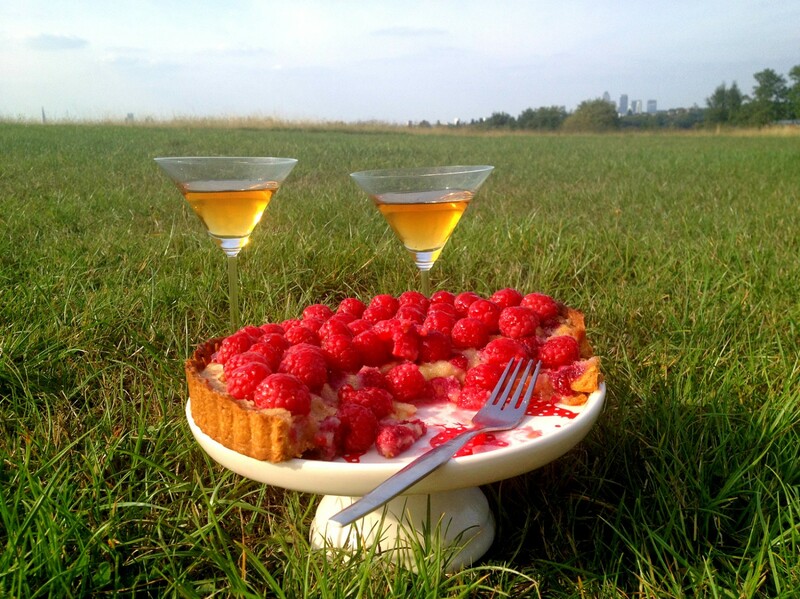 It is shocking what the hot weather does to wine. Another 2 went with the fish. I’m not sure if the photos do justice to the beauty that was this dish. 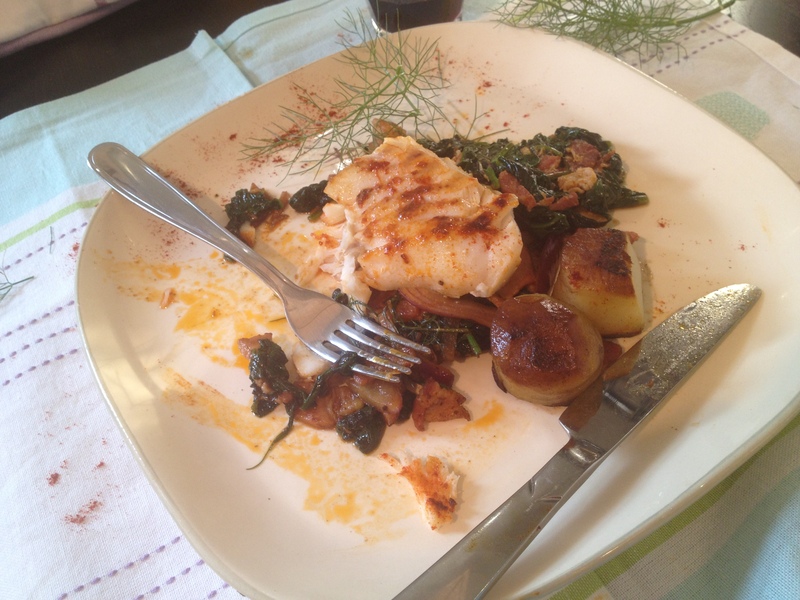 A squeeze of lemon brought out the freshness of the fish and the spinach, and then with the first bite I got a smoky punch of flavour. Three cheers for the latest ingredient to make it to my all-time favourites: paprika, you are my friend! 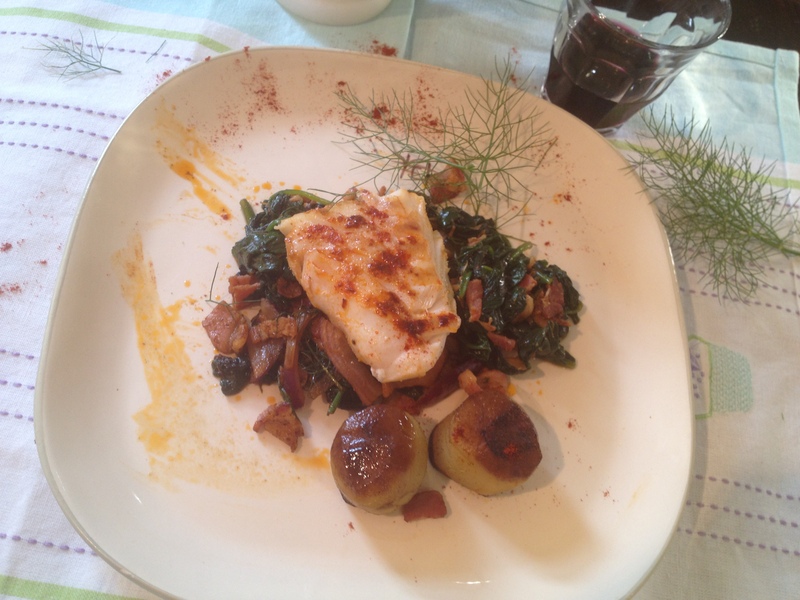 Fillet of cod with smoked paprika, spinach in bacon and fondant potatoes. 4 medium potatoes: Maris Piper, King Edward or any baking potatoes. note: if you choose to use new potatoes, use 8 smaller ones instead of 4 and reduce the total cooking time to 20 minutes. 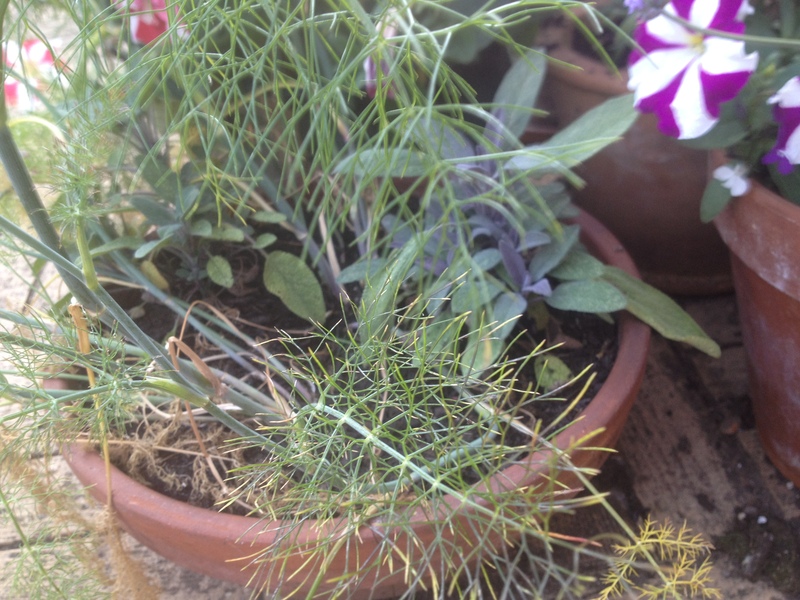 a handful of fresh herbs: sage, rosemary, rocky hyssop, fennel. Using a cookie cutter, cut the potatoes into barrel shapes. They should be about 4cm/ 1.5 high. Or, if you’re using smaller new potatoes, just peel them. Warm 2 tablespoons of olive oil in a frying pan. Over a medium heat, fry the potatoes on one side for 5 minutes, without stirring. Once they’re a dark golden colour, add the butter and the herbs. Turn the potatoes over and fry them for another 5 minutes. 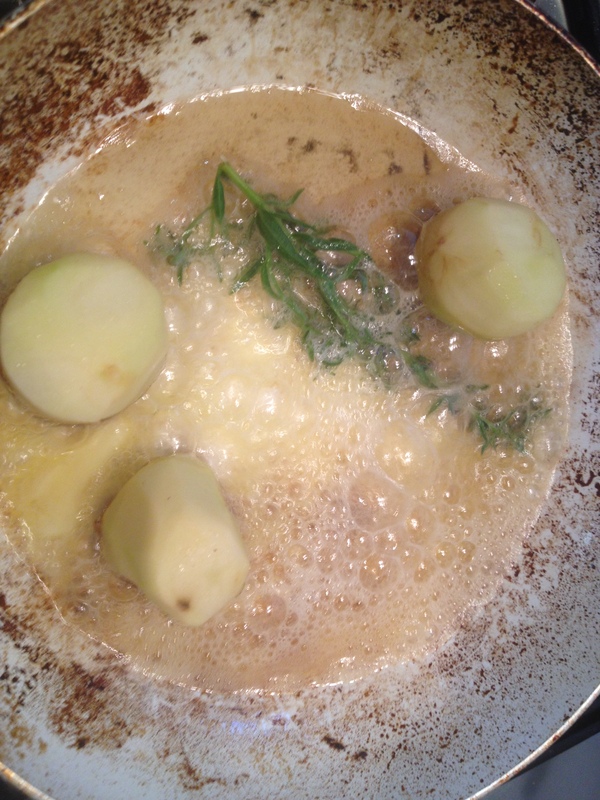 Very carefully add 4 tablespoons of the stock over the potatoes. It will sizzle and splurt and make a bit of a mess around the cooker. Reduce the liquid by half, then add the remaining stock. Lower the heat, cover and cook for 30 to 40 minutes, until the potatoes are tender. Season the cod fillets on both sides with the paprika, salt and black pepper. Steam the fresh spinach just enough for the leaves to begin to wilt. 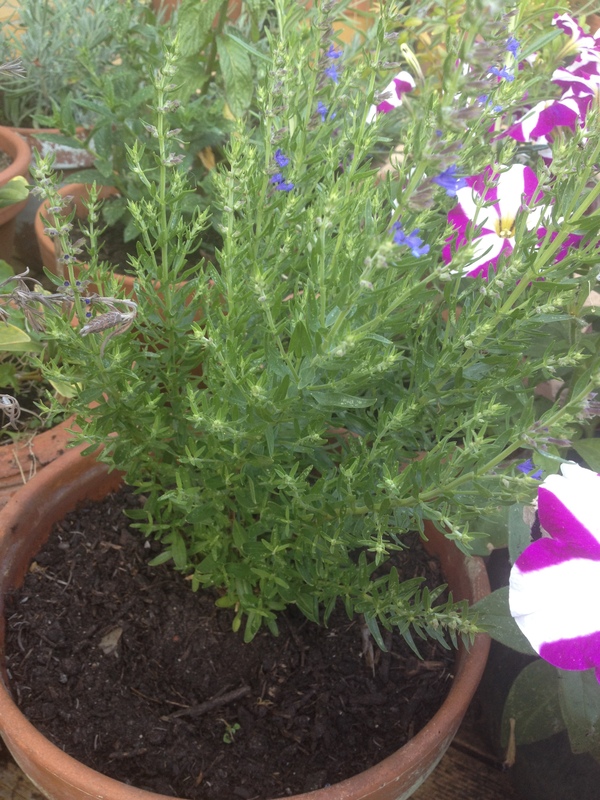 If you don’t have a steamer: fill a large saucepan 3 inches high with water and boil it. 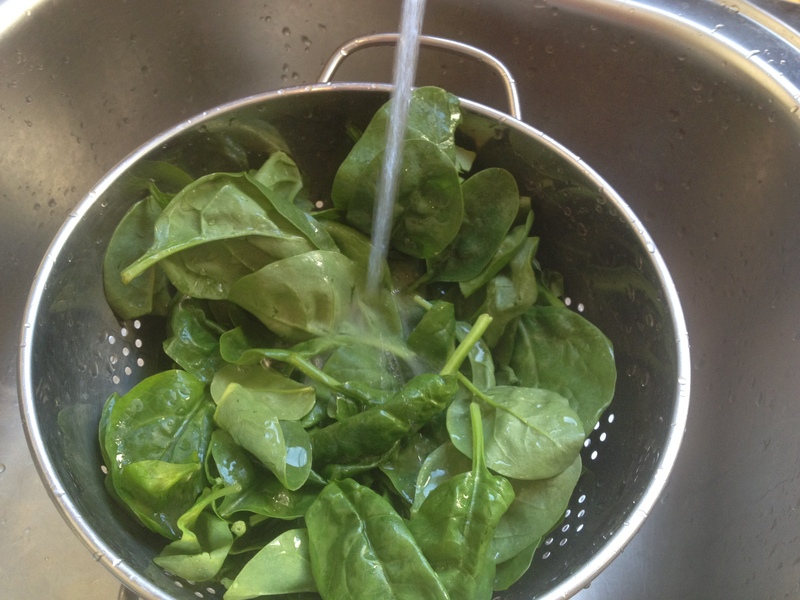 Fill a metal colander with the spinach and place the colander on top of the boiling water, making sure the bottom of the colander does not touch the water. Cover the colander and let it steam for just about minute. note: with young spinach, you don’t strictly need to do this, but it reduces the volume and makes it easier to fit the leaves in the frying pan later. Cut the bacon into small cubes. In a large frying pan, fry a third of the bacon cubes in only a drop of olive oil, over a medium heat. The bacon will continue to release more fat as it cooks. Fry until the bacon is translucent, about 3 minutes. Add the cod fillets, skin side down, and let it cook for 4 to 5 minutes. Do not stir or touch the fish. You may need to do this in batches if the frying pan is not large enough. Carefully turn the fish over, and add the sliced onions around the fish. Add the paprika to the onions and bacon, some salt and pepper, and stir. Cook for another 4 to 5 minutes, over a gentle heat, until the onions are soft and coated in red by the paprika. Check that the fish is cooked through. Remove from the heat, transfer the onions and bacon to a bowl and cover it. Transfer the fish to a warm plate, careful not to break them. Try to keep some of the cooking oil in the frying pan. Add a touch more olive oil and the remaining bacon to the frying pan and let it cook for about 4 minutes. Add the spinach, little by little. Season with salt and pepper and cook for only a minute or even less, until it reduces in volume and is coated in the juices from the pan. Do your very best not to overcook the spinach. 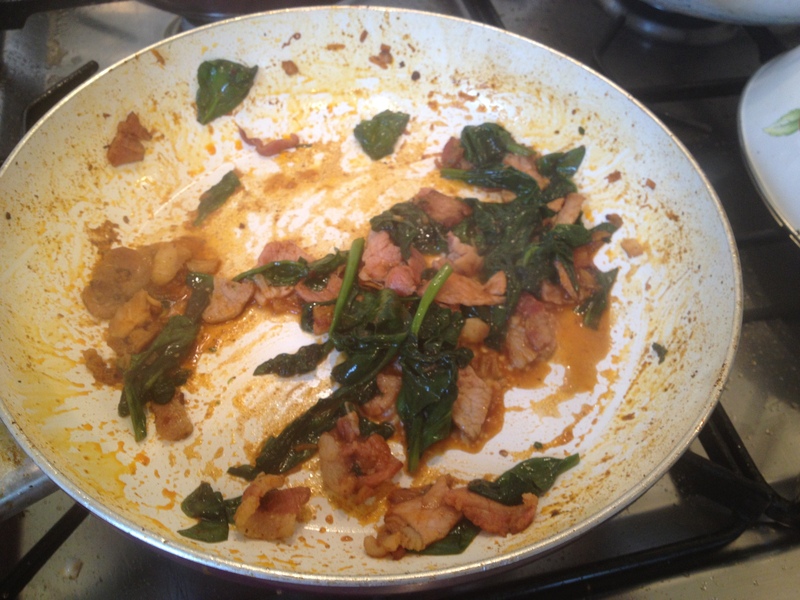 Serve: place the spinach in the middle of the plate and squeeze a bit of lemon on it. Top it with the onions and bacon, then carefully place the fish on top of the spinach. Squeeze some more lemon on the fish and drizzle a bit of olive oil. Add the potatoes to the side and pour some of the reduced stock over them. PS: in what seems to be a tradition with my cooking, I realised long after eating that one ingredient had been left out. 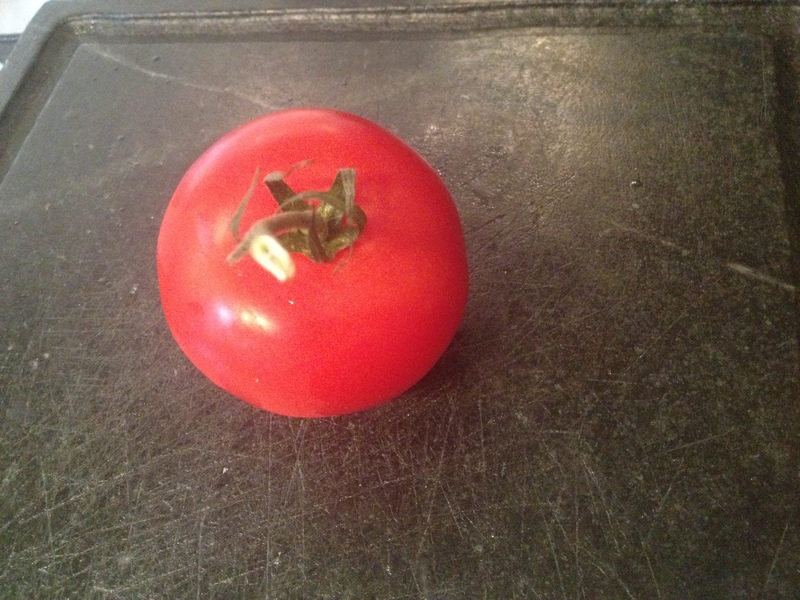 I meant to chop a couple of tomatoes to eat as a fresh salad on the side. You may want to give that a try.